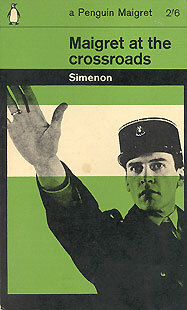 The 1965 printing of Maigret at the Crossroads is priced at 2/6, the same as the 1963 editions. The 1965 printing has a different back cover design from the 1963 printings, with the same photograph of Simenon as appears on the 1965 printings below. Unlike the 1963 printings, nothing is printed on the inside covers.